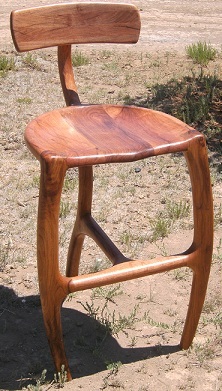 This is a newly designed barstool. 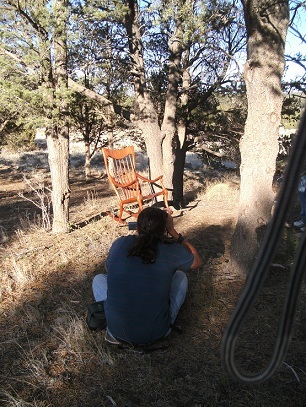 It is made from mesquite and features a bentwood laminated back leg that sweeps up to the back rest, where it is sculpted into it. This was quite a challenging bend with the curves, but the end result is just beautiful. 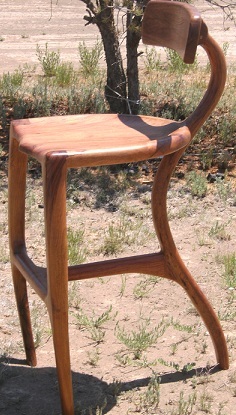 Even though it is a three legged barstool, it is quite sturdy and allows for easy movement in and out of it. making it only three legs, meant that it wouldn’t use up a lot of room as well. The front legs have a bow to them for added leg room. The seat was slightly carved and we made sure to show off the unique joinery where it joins the front legs and back leg. Scott hand shaped the legs into the brace, so that everything would flow. 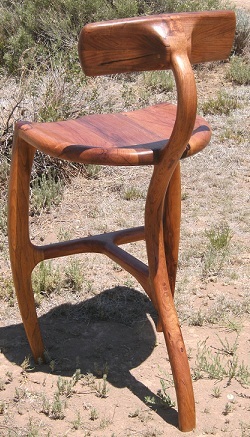 This barstool got a lot of attention at our CA show and resulted in a customer order out of cherry and two sets of friends wanting them as well. We are very pleased with this design. Here you can see the bow in the front legs. Plenty of room to rest those feet on the cross piece. The backrest was shaped to hug your back so you would be comfortable and supported. The beautiful back sweep of this piece is a dramatic effect and adds an artistic element. Close up of where the back leg joins with the backrest. Scott sculpted this area into one another to make them flow and be more pleasing to the eye. Hand sculpting and shaping is labor intensive and very time consuming, but adds beauty to a piece and makes them more sensual to the touch. 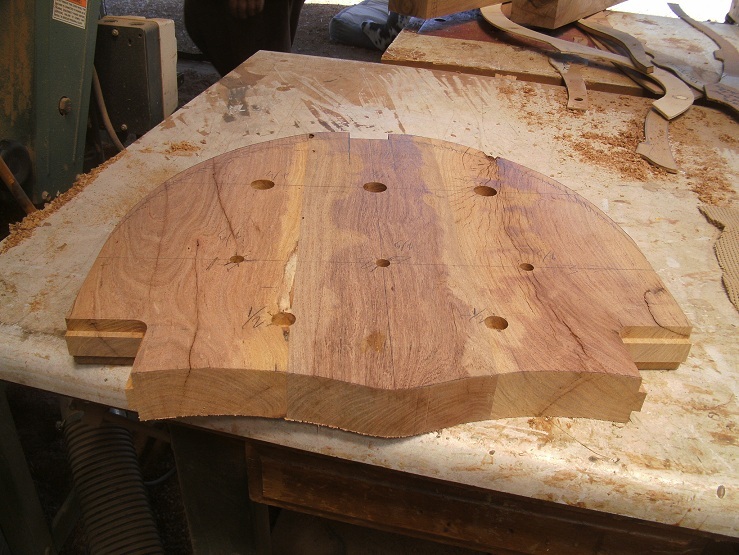 Seat ready to carve and shape. Test fitting the back leg into the seat. Got to get it in just the right spot for everything to work out. The backrest being test fit to see how to shape it. 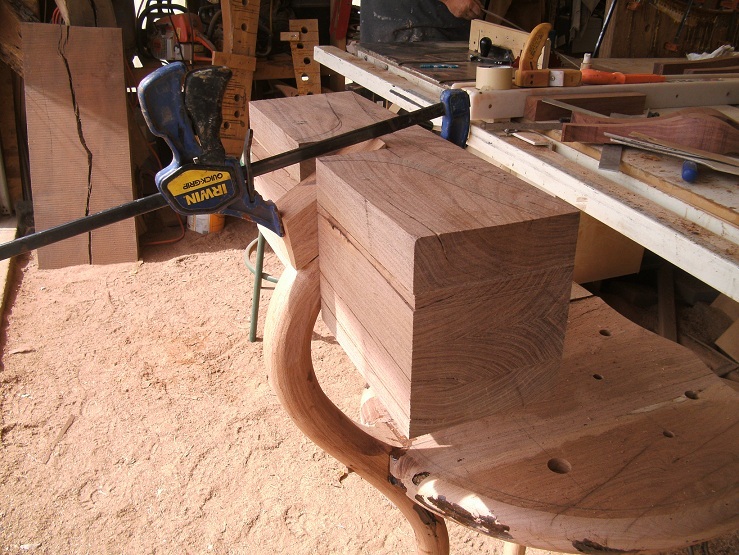 Now the backrest is ready to be cut and then hand shaped before being put on the back leg. 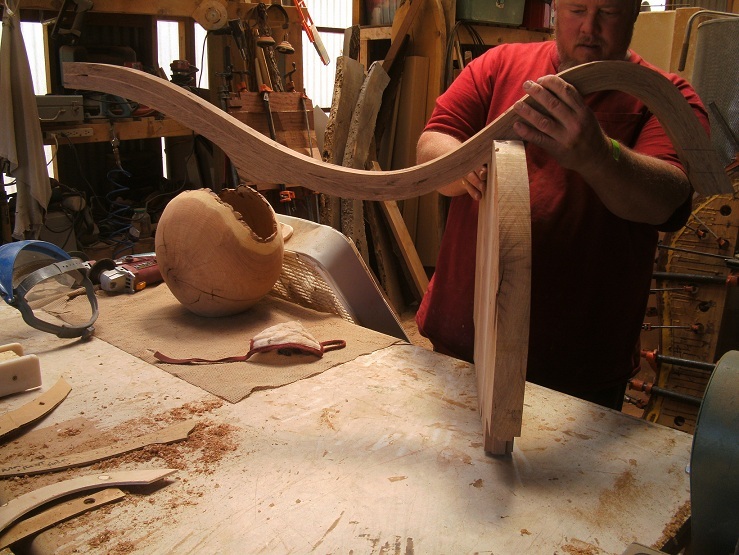 Then it will be glued onto the barstool for the final glueup stage, then everything will be hand sculpted, shaped and sanded to form an incredible looking barstool. 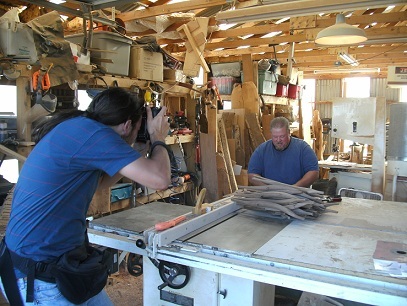 We were so excited to get a call that New Mexico Magazine wanted to do a full article on us. We have had a rocker and a bowl in their Unique Boutique section in the past, but never a full article. One of their writers came from Gallup and interviewed us for an hour. Then a photographer came out and took photos for over two hours. 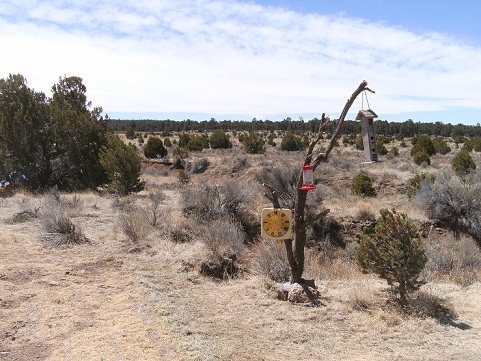 The magazine wanted a New Mexico setting, so the pictures were taken amongst the trees and with a view and the article sounds like it will have more emphasis on our area, why we love it so much, how it inspires us, etc. The article is set to come out in their October issue, which should be on stands in September. I will post when it comes out, but be sure to look for it on stands then. 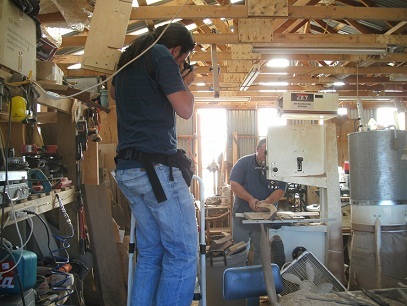 We also had a writer (Jennifer) from Wood Shop News come from back east to do an interview and take photos. She had an interview in Phoenix and then Albquerque and wanted someone in between. She found us and we were available for the date she would be in the area. She brought her daughter with her, so they could see some sites and the first thing she told us was, “I love New Mexico”. She had never been here before and was awe struck. I’m sure coming from back east that this area is both beautiful and overwelming. We had a great interview, she took some photos and checked out our little cabin and then her and her daughter left to go to the Wolf Sanctuary that is down from us. This article won’t be out for a few months. We count our selves lucky and thankful to be included in a magazine that mainly talks about big cabinet shops. Every once in a while they talk about the small mom and pop (in our case husband and wife) shops. Unfortunately our camera was acting up and I didn’t get any pictures of her taking photos. But below is the NM Mag photos. Overall both interviews were great and we can’t wait to see them and the response we receive. We’ve been blessed lately and are very thankful. 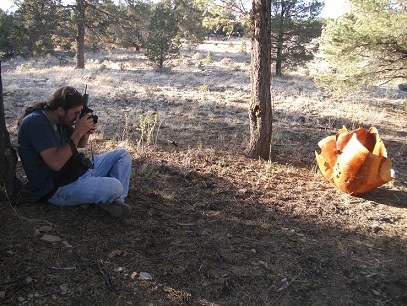 Here are some photos of the photographer for NM Mag taking his pictures. We are so excited and can’t wait to see it and what it might bring. Brian climbed up on just about anything to get his photo. 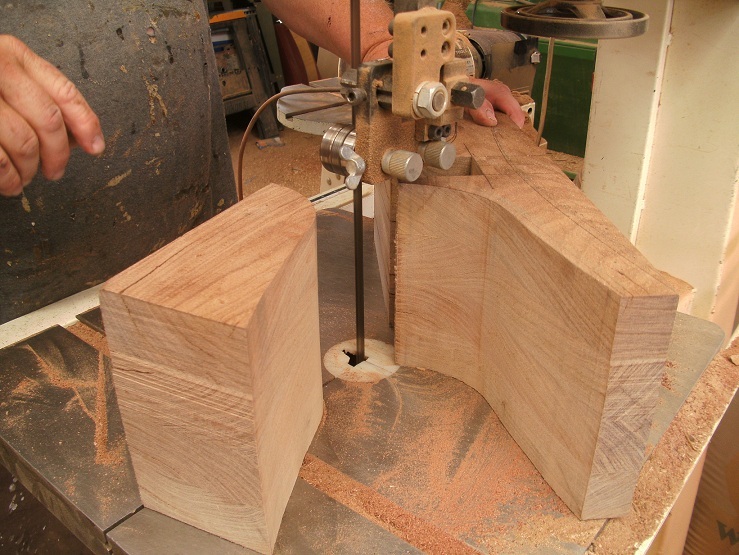 Here Scott is working on the bandsaw. You’re getting a sneek peak of our newest rocker design. it is a combination of our “Shangrila Rocker” with flexible back lumbar supports. Talk about melting into a rocker. This one is soooo comfy. 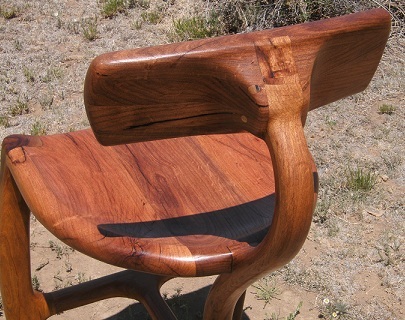 This rocker is made from Bubinga and was a huge hit at our CA show. I will be posting pics of it after I can get it to our photographer. We were able to squeeze in a little time to work on the cabin back in May. It was in need of a fresh coat of stain, so with the help of our spray gun, we got it done in no time. And it looks so much better. We also cleaned up and threw away a lot of things that were just lingering around. We wanted a little color, so we built some window boxes, painted them green and filled them with petunias. We used some old wine barrel planters to anchor everything and added some climbing jasmin, snapdragons and daisies. Now we have color. Just doing that little bit made the place look and feel much better. Our friends and neighbors said we were making them look bad and to stop it. We all had a good laugh with that. Next on the to do list is to do the window trim and add gutters. We’re already making plans for an add on and the long porch on the west side. Hopefully if all goes well with our summer shows, we can buy the materials for that and get started. Nothing new on the inside, but the addition of a treadmil. We were able to make room for it. The additions would help with being able to move the treadmil in there along with the workout equipment we have stored. We are finally getting elk to come through our property and not on the outskirts. I have a trough out for them and with this hot dry weather, they are stopping quite often. Unfortunately it’s when we’re sleeping. But at least they are coming through. We have lots of beautiful birds here right now. Between them and the hummingbirds, we are going through a lot of seed and sugar. But they are worth it. We just love watching all of them. We’ve had a lot of wind the past few months, making it scarey with all the fires in our state and AZ. We were getting lots of smoke from the AZ fire, making short work days. But it’s been clear lately and now we just pray that our area doesn’t have a wildfire like so much of the state. Below are some photos of our little cabin to date. I have also included a photo of the freak snow we had in May. It melted that same day, but what wacky weather. We went to below freezing temps to the 90’s in no time. June has been hotter than normal by about 10-15 degrees with no acclimation for us. I lost a few plants with the unexpected May weather and now they are having a hard time with the heat. Gardening is quite a challenge here. Cabin with a darker stain, window boxes and planters. View of trees a little ways from us, with our new feeder station. This is looking out our french doors. Elk came up on the other side of the raveen right after this photo was taken. This view was blocked by a storage carport and we had just moved it. Great timing. 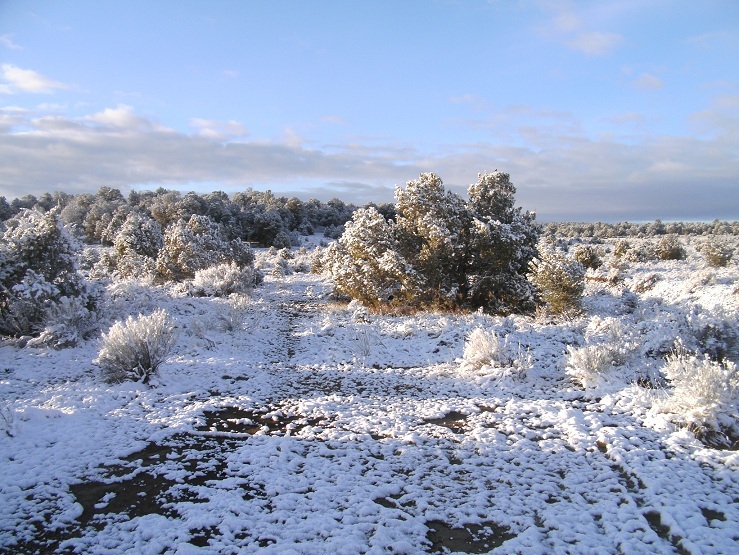 May 9, 2011 Snow fall. View from our french doors. You are currently browsing the Shangrilawoodworks's Blog blog archives for July, 2011.